The journey of a truly wonderful international affair celebrating Olga and Bruce’s big day in Venice began back in the spring, when we received the golden call from Dubai from an exited couple at the end of the line asking us to cover their day ready to tie the knot, in Italy’s most romantic of cities! 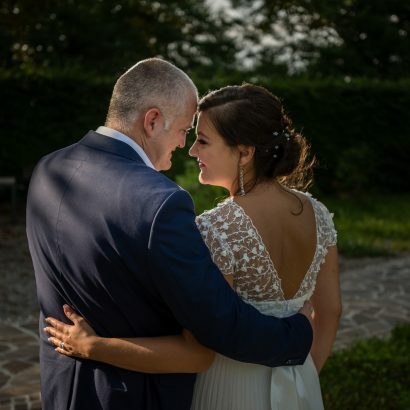 As in all images, capturing the style, dynamics and character that each wedding portrays is essential and equally combining the romance and beauty of a wedding in Venice, will leave us with a set of gorgeous everlasting memories. On the morning of the 4th July, at the luxurious Cipriani Hotel, Olga and Bruce began their day by gently transforming themselves into the bride and groom, ready to embrace one of the most beautiful days of their lives. Those special little moments are just as memorable and important to capture as perhaps the moment the majestic bride sees herself in the mirror for the first time. The moment the groom puts on his cufflinks or the glances between bride and bridesmaid with a fluffy mixture of happiness and nostalgia! All these play a key role in the memories of the big day! The Europa Regina Hotel in Venice became the stunning venue for the wedding ceremony with absolutely captivating views across the Grand Canal as we all stood on the terrace. As guests began to trickle in, the magical atmosphere began to grow further until the moment when the bride and groom were revealed in all sight! Although the ceremony was a beautiful intimate occasion, it really was a “worldly celebration” with an international guestlist including friends and family from literally all corners of the globe which somehow added an even more colourful flavour to the day. Following the ceremony, it was time to set off in style on a gondola ride taking in the magnificent sights Venice is truly famous for including the Rialto Bridge, the Bridge of Sighs and St. Mark’s Square. Once we had snapped our way through the Venetian streets and piazza’s attracting attention with contagious smiles everywhere we went, the time had come to head back to the iconic Cipriani Hotel for the reception. Nestled on the tip of Giudecca Island, the sheer luxury, style and tranquillity of this hotel are legendary and certainly the ideal secluded wedding retreat. Guests socialised, everyone grabbed a glass and united with the newlywed couple enjoying the celebration of this special moment as the sun began to set over Venice. 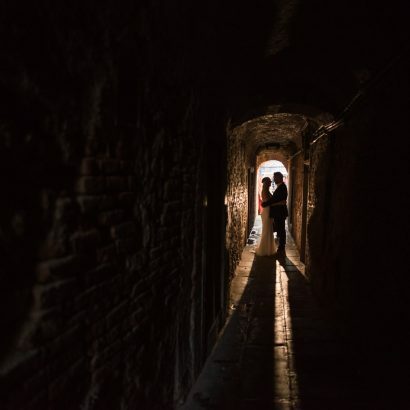 For some “Venice wedding inspiration” and to grasp some further insight into Olga and Bruce’s day, we’d like to share a selection of images from their time in Italy.